The Genericons icon font package, which is used in a number of popular themes and plugins, contained an HTML file vulnerable to a cross-site scripting attack. 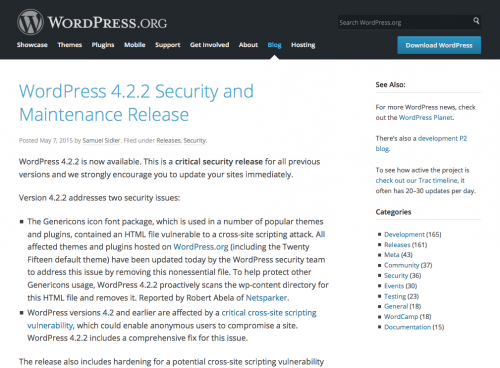 WordPress versions 4.2 and earlier are affected by a critical cross-site scripting vulnerability, which could enable anonymous users to compromise a site. Copyright © 2016 RESOURCE SHARING Inc.